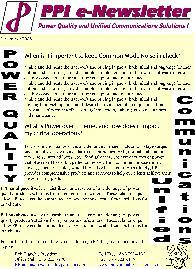 PPI publishes and distributes free monthly newsletters for Power Quality and Unified Communications... just fill in the form below and send it to us to begin receiving your free newsletters. These newsletters provide tips, tricks, and solutions to every day concerns and problems. PPI e-Newsletters are free, 100% opt-in, and can be discontinued at any time. Your contact information is secure... ALL contact information that you provide is used solely for authorized communications from PPI to you/your business and will never be sold or shared with any other entity. We love to be responsive, so keep those cards and letters coming regarding suggested topics for future newsletters. In short, if you've got a question or concern, chances are that many others share the same questions and concerns. Sign-up below and click "send" to join our monthly newsletter! It will be delivered to your email inbox FREE each month.